The Business Aid Centre (BAC) governmentgrantsaustralia.org, Australian Business Funding Centre (ABFC) australiangovernmentgrants.org, Business Grants Australia (BGA) australianbusinessgrants.com.au are just a small example of websites which looks like they have some kind of Australian Government affiliation or official status. These websites can present educational material about government grant programs and, in some cases, videos or news releases showcasing successful grant recipients in a manner which suggests that the website is a service provided or endorsed by the Australian Government. The list may show genuine grant recipients resulting from the government's disclosure under the "Freedom For Information Act"
These sites also show recipients receiving thousands of grant funding as a startup however on investigation you will find many of the business are well established with a track record success and creating employments opportunities. A closer inspection of such websites may reveal disclaimers acknowledging no affiliation with the government as with the BAC, ABFC, BGA web sites (See footer). These disclaimers are easily overlooked as they are normally in small print and at the bottom of the webpage. Prominent phone numbers or other contact methods to "act now" certainly don't help. Anyone looking for small business grants should note that the Australian Government provides grant money to eligible operators and nobody is discouraged from taking advantage of these programs. "Why would the government give me money to startup a new business?" Be aware, the government is responsible to report it's spending publicly as with all of the grant programs and unless a business has a track record with an established revenue base, the business is unlikely to be eligible to receive funding. Where you may wish to use the services of a third party to assist in preparing grant applications, choose a reputable service by doing your homework first and / or contact the Adelaide Hills Business Centre for information. If you have signed up to a questionable service and have paid by credit card discuss your recovery options with your bank or credit card provider ASAP. It can happen to anyone! You can contact the ACCC for more information about protecting your small business or to report a scam by visiting www.scamwatch.gov.au or calling 1300 795 995. 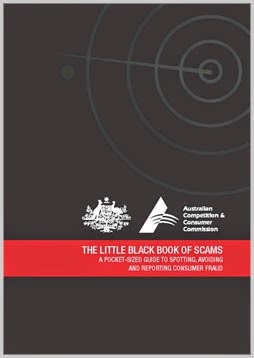 The Adelaide Hills Business Centre has a good stock of the ACCC's "The Little Black Book of Scams" and other information for business owners looking at grants. Yes, and it's for free too!